The advent of 3D printing technology has changed the game for manufacturers: As 3D printers become more widely available – and affordable – what had previously been exclusively dominated by highly skilled workers or heavy duty equipment is now something that can be accomplished with the simple push of a button. “It’s in a transition right now from prototyping, where it has been for the past 30 years, to low-volume manufacturing,” Frank Marangell, the president and CEO of Rize, told IT Business Edge. As Marangell, whose company develops and sells 3D printers, points out, the technology is still in its infancy and has yet to take hold broadly in manufacturing and production. But this appears to be changing quickly, as research from Wohlers Associates predicts that the 3D printing market will jump from $7.3 billion in 2016 to $21.2 billion in 2020. What has held the 3D printing market back from taking hold in manufacturing comes down to two main concerns: practicality and affordability. Older, more primitive 3D printers were prohibitively expensive, cumbersome and largely unable to produce items that would be as strong and resilient as conventionally manufactured goods. This is due to a quirk of most 3D printing technology, that the material it uses to build items must in some way be mailable. Plastics and other polymers have generally been the materials of choice for commercial 3D printers due to their relatively low melting point in comparison to metals. This makes plastic 3D printed materials perfectly acceptable for some applications but less ideal for others, such as the manufacturing of mechanical parts. More resilient materials, like metal, are a whole different matter: Aluminum melts at 660 °C, high-carbon steel at 1,370 °C and titanium at 1,668 °C. 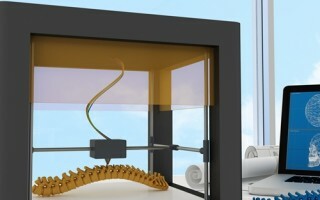 This is well beyond the capabilities of many commercially available 3D printers and renders the technology impractical. While some high-level manufacturers like HP and GE have invested heavily in developing 3D printing technology that can work with tougher materials, companies without mullions of dollars to spend on R&D found 3D technology of limited use. This is where startups like Digital Metal are looking to change thing, developing 3D printers that can work with metals while still remaining affordable. At the same time, the company is looking to integrate some of the more sophisticated aspects of working with metals. Stranco is committed to providing the most up to date label technology for any manufacturing and production application, whether involving human workers or 3D printing. Contact our customer service department for more information and pricing. Posted in Labels & Signs, Numbers & Letters.